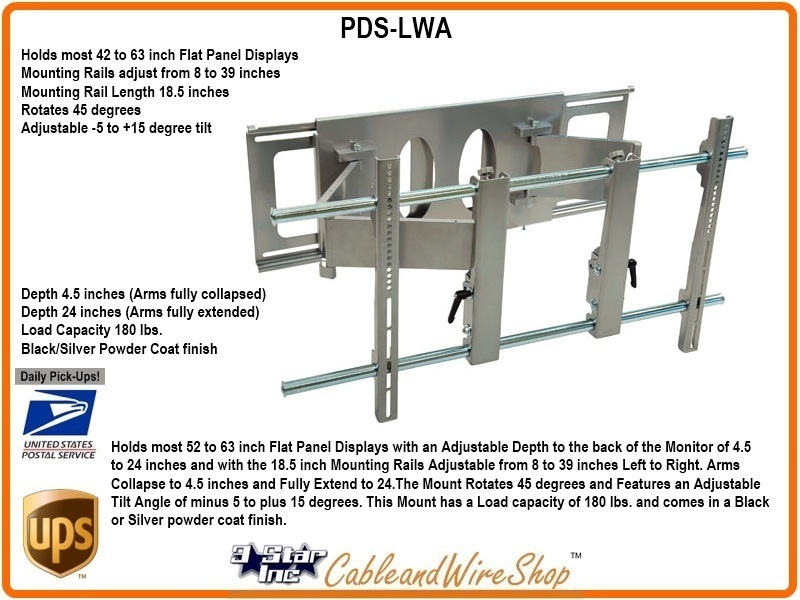 Holds most 52 to 63 inch Flat Panel Displays with an Adjustable Depth to the back of the Monitor of 4.5 to 24 inches and with the 18.5 inch Mounting Rails Adjustable from 8 to 39 inches Left to Right. Arms Collapse to 4.5 inches and Fully Extend to 24.The Mount Rotates 45 degrees and Features an Adjustable Tilt Angle of minus 5 to plus 15 degrees. This Mount has a Load capacity of 180 lbs. and comes in a Black or Silver powder coat finish. Flexibility and Convenience. In today's environment, whether for personal or professional use, you want to be able to free up premium floor and furniture space. Getting a large flat panel up on the wall, or hung from the ceiling to accommodate the need for additional speakers and electronics is a must. Video Mount Products' complete line of flat panel display mounts provide the solution for even the largest plasma and LCD screens, while never sacrificing great looks and allowing for multiple viewing angles. VMP's flat panel mounts are designed for a variety of applications, including the residential, educational, and professional markets. Whether in the living room, bedroom, classroom, or boardroom, VMP flat panel wall and ceiling mounts are the answer to today's multiple application necessities!